Pairing Up With Pasta | What Smells So Good? Though I have some results from the Great Cookie Search (yeah, I named it) to share with you. I wanted to take a break from all the sugar and fat of the bakery world and give you something deliciously savoury for a change. I was originally planning to make some gazpacho (my own recipe) and / or ceviche for yesterday's lunch, seeing as it was Cinco de Mayo and all, but I discovered we were lacking in both the bell peppers and the tomato juice required, so that plan went down the drain like a tequila shot at a college party. No matter. I found something that was equally, if not more, delicious and satisfying, and it used up a bunch of the ingredients I had languishing bot h in my fridge and my pantry. 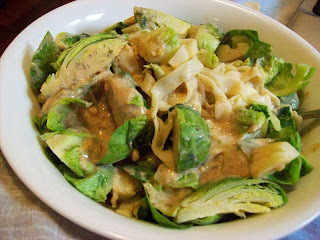 Nice al dente brown rice fettuccine got tossed with one of my favourite vegetables ever - roasted Brussels sprouts - before I blitzed up (oh, how I love that Nigella-esque word) a decadently creamy sauce with some low-fat silken tofu, lemon, garlic and spices and poured it overtop. In a half hour, I had a wonderfully hot, sumptuous meal that I realized just before scarfing that - hey, this qualified for Ruth's Presto Pasta Nights event! Ergo, a photo was snapped and the recipe got hastily scribbled onto the back of my knitting pattern sheet, so I could tell you all about it (but that was yesterday before I got too lazy to write an entry. Sigh). On the plus side, I got a yummy meal yesterday, and today I got to have a visit with my favourite teacher V when I brought her some cookies. But that's the next post. Onto the pasta! Spray a glass baking dish lightly with olive oil. Add the sprouts to the pan and roast at 375 F for 10 minutes. Stir, and roast for 10 more minutes. Meanwhile, place tofu, garlic, lemon juice, salt, paprika, onion powder, parsley, dill and water in a food processor and puree smooth. Toss noodles and sprouts together in a bowl. Pour the tofu mixture overtop and serve with cracked black pepper. Looks delicious. I love Brussels Sprouts but never did them in pasta before. Thanks for sharing with Presto Pasta Nights. Brussels Sprouts are so good, I've never thought of them in a pasta dish, but it looks wonderful.